Not everything is predictable. No matter what people have told you, a lot of things may be much harder than expected. It could be frustrated when things do not turn out the way it should be. At this moment, a positive and supportive companion around is extremely important for people who can easily lost confidence, for example, Tim Gunn from Project Runway. He might be the only reason I’ve watched quite a few seasons of this reality show. (There are a few nice designers in the show, but I definitely do not like Heidi Klum/Michael Kors/Nina Garcia.) I always like to hear him saying “Make it work” and “Carry on” to the contestants. I guess, as a fairly negative person, I am lucky to have several “Tim Gunn”s in my life, including the one who’s been very close. Being together after years, we are facing a so far the biggest challenge ahead and some unforeseen physical uneasiness happened to me. I am really grateful how he stood by me and helped me through all the miseries. I won’t tell him that, otherwise he would be too proud of himself. However, he is not always supportive regarding my crafts. Therefore, I was quite happy when he seems happy with the eggplant hat. Although it might be only due to the reason I knit but not the thing I knit, it’s encouraging enough for me to keep on knitting. 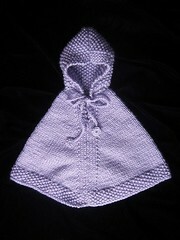 The next finished project is this nice poncho from DROPS design. Both of us fell in love with the sweet little model on the page. 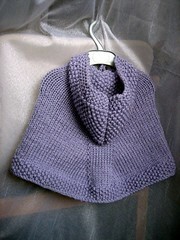 I used two folds of yarn so I can reach the right gauge and the poncho also looks “chunkier”. The seed stitches on the hood and the edge give a very nice touch to the piece. I didn’t even read through the pattern before cast-on, which turns out to be a good thing. Parts of the pattern in increasing stitches were so confusing that I wouldn’t consider this project if I’ve read it more carefully beforehand. 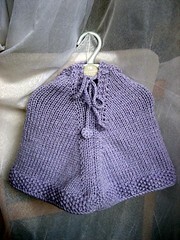 In that case, I wouldn’t have my own sweet little poncho in lilac. For anyone who wants to try this pattern, some sketches of the piece would be helpful to understand the pattern better. There are two seams to be sewn together. Don’t be confused by the sweet picture here! I absolutely agree. It is hard to keep going and not let negative thoughts effect you. But when it comes too bad health, I find that crafting is one of the few things that I can still do and enjoy. Especially projects that can be done anywhere including in bed. It is nice to hear that you’ve been getting some positive reactions. And I really love the things you’ve been making too and I’ll hope you’ll continue to do so even if his interest would fade a little, because you are so creative and make such lovely things, but it is mostly about doing something you enjoy and you should always keep doing that. I love Tim Gunn too! He is the biggest reason I watch the show as well.